A water heater that isn’t providing hot water isn’t good for much. That’s kind of its entire purpose for existing, after all. Of course, just because your water heater isn’t currently providing water, doesn’t mean that you need to get a new one. It’s possible that you just have a problem of some sort in the system that needs to be resolved for it to return to normal function. If your water heater isn’t providing enough hot water, read on to find out why that might be happening. This is a common one in areas with hard water problems, although it can technically happen anywhere. All water contains trace amounts of minerals, most of which are harmless. Over time, though, these minerals can build up on the bottom of the tank until they insulate the water inside from the burner assembly. Essentially, the heat the system is generating isn’t making it through the sediment to warm the water inside the storage tank. This can be resolved by flushing out the tank, which is a common procedure during annual water heater maintenance appointments. If the sediment is built up enough, though, it may need to be manually scraped out. The burner assembly is the collection of gas jets that are responsible for actually heating the water in your system. Carbon particles tend to build up on the burner assembly over time, and can eventually become large enough that they clog the jets. This will cause them to fire later than they should, and eventually will prevent them from firing at all. No functioning burner assembly, no heat for the water heater. If you are still getting hot water, but it’s interspersed with sudden blasts of cold water at the faucet, then you probably have an issue with your dip tube. 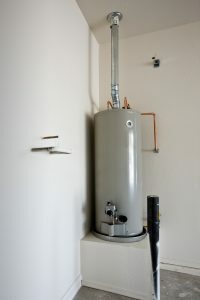 The dip tube is the part of the water heater that guides new water to the bottom of the tank. The tube is made of PVC, usually, which makes it more susceptible to cracking than other parts of the system. A cracked dip tube leaks cold water from the water line into the hot water leaving the tank, which is what causes those sudden temperature fluctuations. The tube will likely need to be replaced if this is the cause of your issues. Please note that, as with all of our blogs, the best way to tell why your water heater is acting up is to schedule an appointment with a technician. Internet research can only tell you so much, after all. So, if your water heater is currently not heating water the way it should be, it’s time to call a professional to look over it for you. Tuckers Air Conditioning, Heating & Plumbing provides comprehensive water heater repair services. If you’re looking for a plumber in Rockville, MD, we can help. Contact us today to schedule an appointment with one of our professional plumbers.